NOTE: THE TOPIC OF TAHREEF ( Quranic corruption, alteration) IS NOT ONLY FAMOUS AMONG NON MUSLIMS BUT THIS IS ALSO ONE OF THE CORE FUNDAMENTALS OF SHI`A AQEEDAH AND THEIR DEEN. THERE ARE 1000 PAGES OR EVEN MORE CONTENT OF REFUTATION FILLED WITH PROVES AGAINST THEM ON THIS TOPIC BUT I SHALL ONLY PRESENT A SHORT SUMMARY FOR THE COMMON READER. Alee, may Allah be pleased with him, said: "Whoever disbelieves in a letter from it (the Qur`an), so surely he disbelieved in all of it"
The way of the Shia is to cling to any random weak narration in the Books of Sunnis and make it an undisputed historical fact if it happens to agree with their beliefs and if it supports their case against the companions of the Prophet (s.a.w). However, if a narration is quoted against them, you will see them researching and citing sources and studying the authenticity and the text and trying to give various interpretations in order to defend their Madhab. Some Videos that will SHOCK YOU OUT IF YOU AREN'T A STUDENT OF KNOWLEDGE ON SHI`ISM. 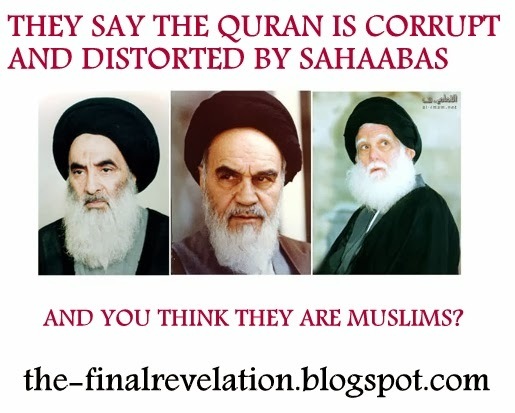 So if a person is a Muslim and does not believe in Quran means denies this ayeh, so you cant call them Muslim. And since all of shia believe in Quran and this ayeh is part of it, you cannot have such a claim against shia. Another point is as you may know all of 4 sunni imams (imam hanaf, imam malek, imam shafe, and imam hanbal [alaihem o salam]) were the students of Imam Jafar e Sadiq (alaihe salam), so based on this there is not much difference between shariat law of Sunni and Shia. For example, a shia can pray behind a sunni imam and I myself do. So, instead of trying to make division in Islam, lets stay brothers and keep to the Habl o Allah and get united. Akhi Mohsen, the problem is that we don't know if what you are speaking right now is true or taqiyah. As taqiyah is a part of shi`a emaan said by all your Imaams. so it's very difficult for us. Nevertheless, if you say as you say , what we would reply is your personal observation or rulings are actually Zero in comparison to the rulings and fataawa of your scholars and your predeccesors. we cannot change our opinion of Hinduism based on what some random Hindu says. Likewise for Islam. Likewise for everything, So if your belief is as you say then Alhumdulillah you don't believe in tahreef. Mohsen are you a Rafidite?